The hepatocyte nuclear factor-1β encoded by the TCF2 gene plays a role for the specific regulation of gene expression in various tissues such as liver, kidney, intestine, and pancreatic islets and is involved in the embryonic development of these organs. TCF2 mutations are known to be responsible for the maturity-onset diabetes of the young type 5 associated with renal manifestations. Several observations have suggested that TCF2 mutations may be involved in restricted renal phenotypes. Eighty children (median age at diagnosis 0.2 yr) with renal cysts, hyperechogenicity, hypoplasia, or single kidneys were studied. Quantitative multiplex PCR amplification of short fluorescence fragments for the search of large genomic rearrangements and sequencing for the detection of point mutations were performed. TCF2 anomalies were detected in one third of patients (25 of 80). The main alteration was the complete deletion of the TCF2 gene detected in 16 patients. Family screening revealed de novo TCF2 anomalies in nine of 17 probands with a high prevalence of deletions (seven of nine). TCF2 anomalies were associated with bilateral renal anomalies (P < 0.001) and bilateral cortical cysts (P < 0.001). However, abnormal renal function, detected in 40% of patients, was independent of the TCF2 genotype. No difference in renal function or severity of renal morphologic lesions was observed between patients with a TCF2 deletion and those with point mutations. In conclusion, TCF2 molecular anomalies are involved in restricted renal phenotype in childhood without alteration of glucose metabolism. These findings have important implications in the diagnosis of patients with renal dysplasia with cysts and their follow-up. Hepatocyte nuclear factor-1β (HNF-1β) is a members of the homeodomain-containing superfamily of transcription factors. HNF-1β functions as homodimers or heterodimers with the structurally related member HNF-1α (1). It plays a role in the tissue-specific regulation of gene expression in various organs (2), such as liver, kidney, intestine, and pancreatic islets (3). It is also greatly involved in the embryonic development of these organs. HNF-1β is encoded by the TCF2 gene, and heterozygous mutations in TCF2 are associated with a monogenic form of diabetes, the maturity-onset diabetes of the young type 5 (MODY5) (4). It is characterized by an autosomal dominant inheritance and nonketotic diabetes as a result of a primary defect of insulin secretion (5). Renal manifestations are systematically observed in patients with MODY5 and TCF2 mutations. They include a diverse spectrum of renal morphologic and structural manifestations such as hypoplastic glomerulocystic kidney disease (6–8), cystic renal dysplasia (9), solitary functioning kidney (10), horseshoe kidney (11,12), and oligomeganephronia (13). Patients with TCF2 mutations have mild to moderate renal failure in the absence of diabetic nephropathy (14). Moreover, pancreatic atrophy, urogenital abnormalities, and abnormal liver enzyme levels are observed in patients with TCF2 mutations (10,13,15–17). Several observations have suggested that TCF2 mutations may be involved in restricted phenotypes, in particular, renal diseases in young patients (7,10). To address this issue, we studied 80 children who presented with structural renal abnormalities that were detected either in utero on antenatal ultrasound scanning or in the postnatal period. We showed that TCF2 molecular anomalies are responsible for approximately one third of renal anomalies with dysplasia and/or cysts. The mutational spectrum was characterized in two thirds of patients by the identification of large genomic deletions in the TCF2 gene that mainly occurred de novo. These findings may have major clinical implications in the diagnosis and follow-up of patients with renal dysplasia. Eighty children (27 girls) from four pediatric departments were included over a period of 2 yr (2003 to 2004). Most of them were white (77 of 80), two were Northern African, and one was Central African. Only sonographic criteria of the first postnatal examination were used as inclusion criteria. Patients were included when at least one of the following renal phenotypes was observed: (1) Unilateral multicystic dysplasia, (2) uni- or bilateral cystic kidneys, (3) uni- or bilateral renal hypo/dysplasia without cysts, and (4) single kidney. Absence of clinical evidence of other known genetic anomalies, such as autosomal recessive polycystic kidney disease, autosomal dominant polycystic kidney disease, and syndromes related to mutations of PAX2 and EYA1, were confirmed for all patients. All parents gave written informed consent for their children. Sonography examinations were performed in each center and reviewed by two independent investigators. Only the first postnatal sonography was analyzed, and results were summarized in a standardized pattern. The following criteria were analyzed: Renal cysts, hyperechogenicity, hypoplasia, and dilations. Renal cysts were divided into cortical and medullary cysts and into two subgroups: Microcysts (<10 mm) and macrocysts (≥10 mm). Renal dysplasia was considered when poor corticomedullary differentiation and/or diffuse hyperechogenicity were found on sonography. Renal hypoplasia was defined as a kidney length of <2 SD for age (18). Serum creatinine was measured in each center and analyzed referring to the local normal values. GFR was estimated using the Schwartz formula, and an estimated GFR <80 ml/min per 1.73 m2 was considered as renal failure. Serum levels of hepatic enzymes (ASAT and ALAT) and fasting blood glucose were analyzed using standard methods. We did not use biologic values that were obtained before the age of 3 mo to avoid misinterpretation of early creatinine values. The last follow-up for all children was performed at a moment without infection, dehydration, or other pathologic conditions that might interfere with renal function or other study parameters. Two molecular strategies—quantitative multiplex PCR amplification of short fluorescence fragments (QMPSF) for the search of large genomic rearrangements and sequencing for the detection of base pair substitutions or small insertion/deletion—were performed sequentially in 77 probands. When a TCF2 anomaly was identified in a proband, the direct diagnosis then was done in affected siblings and offered to parents whatever their clinical status. QMPSF based on the use of a limited number of PCR cycles enables the detection of gross genomic rearrangements (19). We applied this method to the exons 1 to 8 of the TCF2 gene. PCR amplification conditions and QMPSF analysis were done as described previously (20). In all experiments, we included two DNA as controls, one with a complete TCF2 heterozygous deletion and the other with a known heterozygous TCF2 mutation. To confirm complete TCF2 deletions, we used real-time quantitative PCR based on SYBR-Green fluorescence as described previously (20). Single-exon deletions were confirmed using a second set of exon-specific primers to exclude a false-positive result as a result of unreported polymorphisms that affect primer amplification. Patients without TCF2 rearrangements then were screened by direct sequencing. The minimal promoter, the coding regions, and exon-intron boundaries of the TCF2 gene were screened for mutations by direct sequencing as described (4). Data were summarized as mean ± SEM for normally distributed data and as median and range for nonnormally distributed data. Results were analyzed using two-sample t test to compare means and using Mann-Whiney test to compare nonnormally distributed data. The level of statistical significance was set at P < 0.05. Eighty children (77 probands, three siblings) with a structural renal abnormality on the first postnatal sonography were included. Postnatal sonographies were performed because antenatal sonography was abnormal in 50 of 80 and because of the occurrence of urinary tract infections, abdominal pain, or unexplained fever in the 30 other children. The median age at diagnosis was 0.2 yr (range 0 to 14). Thirty-two (40%) of 80 patients had unilateral multicystic dysplasia, and 16 of them had a contralateral anomaly (cysts, hypoplasia, or dysplasia). Approximately one third (25 of 80) had an isolated cystic kidney disease, and in 17 of them, the cysts were bilateral. In 17 (21%) of 80 patients, bilateral renal hypoplasia and/or dysplasia was diagnosed, including 11 patients with both hypo- and dysplasia, four patients with isolated hypoplasia, and two patients with isolated dysplasia. Finally, six (7.5%) of 80 patients had a single kidney without a contralateral anomaly (Figure 1). Prevalence of TCF2 anomalies in patients with multicystic dysplasia, isolated renal cysts, hypo/dysplastic kidneys, and single kidneys. ▒, patients with TCF2 anomalies; □, patients without TCF2 anomalies. Twenty-five patients were carriers of a TCF2 anomaly: (1) Eight (25%) of 32 patients with multicystic dysplasia (all of them [eight of eight] had a contralateral anomaly, (2) 13 (52%) of 25 patients with isolated renal cysts (all of them [13/13] had bilateral cysts, and (3) four (21%) of 17 patients with hypo/dysplastic kidneys (three had hypoplasia and dysplasia, and one revealed only bilateral dysplasia without hypoplasia). Finally, no TCF2 anomaly was detected in the six patients with a single kidney. A heterozygous molecular alteration of TCF2 was found in 22 (28.6%) probands. Among the 22 TCF2 anomalies identified, the complete deletion of TCF2 (M1_W557del) was detected in 14 (64%) probands. Whole-gene deletion was confirmed using the real-time quantitative PCR for the nine exons of TCF2. The size of the deleted region was estimated to 1.2 megabases by genotyping four neighboring microsatellite markers (D17S927, D17S798, D17S1818, and D17S1787) and two sequence-tagged sites from the neighboring gene TRIP3 and the genomic contig AC113211 (data not shown). A single-exon deletion of exon 4 (R270_G349del) was identified in one proband. In this series, two thirds of the molecular alterations that were identified in TCF2 were large genomic deletions (15 of 22) with a main alteration consisting of the complete TCF2 deletion (14 of 22). Six different mutations were identified in the other seven probands (Figure 2). All are located in the 5′ part of the gene, one in the dimerization domain (Leu16fs) and the other five in the DNA-binding domain. 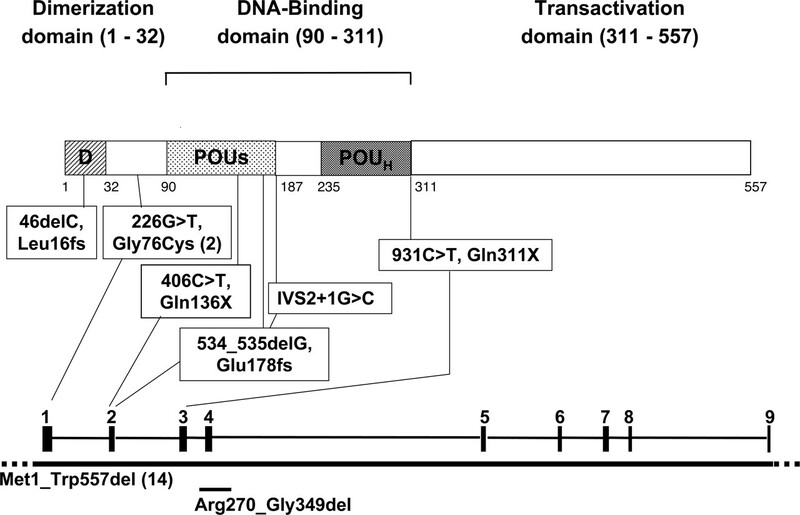 Four of them consisting of two nonsense mutations (Gln136X, Gln311X) and two deletions of 1 bp (Leu16fs, Glu178fs) result in a truncated protein that lacks the 3′ part of the DNA-binding domain and the C-terminal domain. One mutation, IVS2 + 1G>C, a novel base pair substitution, affects the splice donor site of intron 2 described as a hot spot of mutations in the TCF2 gene (21). The last mutation, identified in two probands, is an amino acid substitution (Gly76Cys) located between the dimerization domain and the DNA-binding domain. This mutation affects a residue conserved in human, pig, mouse, rat, Xenopus, and salmon TCF2 sequences. This point mutation was absent in 212 chromosomes of unrelated white control subjects. Mutational spectrum of TCF2 alterations in the 22 probands with structural renal anomalies. The position of the TCF2 mutations identified is indicated in reference to the schematic representation of TCF2 domain organization (residues 1 to 557, top) and exon-intron structure (exons 1 to 9, bottom). Large genomic deletions (solid line) are indicated under the exon-intron structure. Met1_Trp557del and Arg270_Gly349del correspond to the deletions of the whole gene and exon 4, respectively. The numbers in parentheses beside mutation or deletion is given for occurrence superior to 1. The three affected siblings were carriers of the TCF2 alteration that was identified in the respective proband. The parents of 17 probands, including six with a point mutation and 11 with a genomic deletion, were genotyped for the corresponding TCF2 alteration and the neighboring microsatellite markers. In eight of them, co-segregation with the TCF2 alteration was consistent with autosomal dominant inheritance. Family history investigation showed that all parents who had a diagnosis of a TCF2 alteration had clinical manifestations observed in adults with TCF2 anomalies. In the other nine probands, the TCF2 alteration occurred de novo. Among them, seven were genomic deletions of the TCF2 gene. We then analyzed renal morphologic and functional abnormalities according to the presence of TCF2 molecular anomaly (Table 1). First, renal cysts were analyzed on the basis of their location and size. Cortical cysts were more frequently observed in the group of patients with a TCF2 anomaly, but the difference was not statistically significant. By contrast, bilateral cortical cysts were significantly associated with a TCF2 anomaly (P < 0.0001). The size of cysts was also discriminant; microcysts were more frequently observed in the group of patients with a TCF2 anomaly (P < 0.01): Among the 25 patients with TCF2 anomalies, 21 had cysts; all of these had microcysts. Second, analysis of hyperechogenicity reflecting a poor corticomedullary differentiation showed that only the bilateral feature of this anomaly discriminated significantly the two groups of patients (P < 0.005). Third, the detection of uni- or bilateral hypoplasia and renal dilations did not differ between the two groups. Considering all renal sonographic characteristics, bilateral abnormalities, whatever their type, were a constant feature of patients with TCF2 anomalies (P < 0.0001). Finally, the analysis of the number of abnormal renal sonographic characteristics showed that in patients with a TCF2 anomaly, a higher number of structural anomalies was diagnosed. Serum creatinine was analyzed at last follow-up. The median age for the whole cohort at last follow up was 4.1 yr (range 0.3 to 18 yr); there was no age difference for the patients with TCF2 anomalies (2.4 yr; range 0.4 to 18 yr) compared with those without (4.8 yr; range 0.3 to 17.9 yr). The mean GFR of patients with TCF2 anomalies was not different from those without TCF2 anomalies (81.7 ± 6.97 versus 80.7 ± 5.69 ml/min). A similar proportion of renal failure (GFR < 80 ml/min per 1.73 m2) was observed in both groups: 44 and 40% in TCF2-positive and -negative patients, respectively. Among the 16 patients with a heterozygous complete deletion of the TCF2 gene, 14 (88%) had cysts, compared with 78% of patients with other mutational events. Dilations were more frequent (44%) in patients with a gene deletion compared with patients with mutations (13%; NS). Seven (44%) patients with deletions had a GFR <80 ml/min per 1.73 m2 versus four (44%) patients with mutations. No statistically significant difference in renal function or severity of morphologic sonographic lesions between the patients with large genomic deletions or mutations could be revealed (Table 2). Fasting blood glucose levels ranged from 4.3 to 6.0 mmol/L in the 25 patients with TCF2 anomalies. Liver enzyme levels (ASAT/ALAT) were 2.5 times the upper normal limit in three of 25 patients. Urate values were available for 23 children and revealed moderately elevated levels (<1.5 times the upper normal level) in seven children. A sonographic evaluation of the pancreas size was obtained only in five children and was normal. In this study, we showed that in children, renal structural abnormalities that are diagnosed for the most part in the first year of life with or without renal failure are explained by molecular anomalies in the TCF2 gene. We identified 25 TCF2 molecular alterations in a cohort of 80 children who presented with multicystic dysplasia, isolated renal cysts, hypo/dysplastic kidneys, and single kidneys. This large series highlighted several sonographic peculiarities related to TCF2 alterations. The most striking feature was the constant observation of bilateral renal structural abnormalities whatever their type in patients with TCF2 alterations. Second, the detection of cysts that were combined or not with renal dysplasia correlated significantly with the presence of TCF2 alterations. In our cohort, the large majority (21 of 25) of patients with TCF2 mutations have renal cysts. Therefore, the use of two sonographic characteristics, the detection of bilateral renal abnormalities and the presence of cysts, should enable detection of children with renal morphologic abnormalities with a positive predictive value of 64% (100% sensitivity and 66% specificity). Correlations were less clear for bilateral hypo- or dysplasia; only one fourth of patients with such anomalies were carriers of TCF2 alterations. Last, no TCF2 mutation was found in children who had a single kidney. These findings contrast with a recently published study on adult patients that revealed a single kidney in two patients with TCF2 mutations (11). This might be explained (1) by the small number of tested children with a single kidney or (2) as a possible involution of multicystic dysplastic kidneys in adult patients, consequently diagnosed as single kidney. The progressive character of renal lesions related to TCF2 anomalies is emphasized by the analysis of antenatal sonographies, available for 20 children with TCF2 mutations in our cohort. Antenatal sonographic anomalies showed mainly uni- or bilateral hyperechogenicity (17 of 20) and/or uni- or bilateral cysts (nine of 20). Among the 11 antenatal hyperechogenic kidneys without cysts, seven exhibited renal cysts on the first postnatal sonography examination, suggesting a progressive character of TCF2-related renal phenotypes. Reciprocally, improvement of preexisting lesions, such as disappearance of cysts, has been seen in two children. The renal morphologic anomalies that were observed in the 25 children with TCF2 mutations fit well with the known expression pattern of HNF-1β in the kidney. Expression studies in rat and mouse showed that HNF-1β is important from the earliest induction phases of kidney development (3,22). HNF-1β expression has also been found in fetal human metanephric kidney (23). Two recent studies showed the relationship between HNF-1β and other cystic kidney diseases, suggesting that HNF-1β might be a major actor in cystogenesis (24,25). In one fourth of patients with bilateral cysts and half of those with multicystic dysplasia combined with a contralateral anomaly, no TCF2 alteration was identified. These findings may be explained either by genetic heterogeneity of the disease or by other mutational mechanisms such as intronic variants located outside the coding sequence and exon/intron junctions that are missed by conventional screening method on genomic DNA. Renal failure was not a constant finding in patients with a TCF2 anomaly. Nearly half of them had a creatinine clearance <80 ml/min per 1.73 m2. This observation contrasts sharply with phenotypes that have been described in adult patients with MODY5 (17,20). The impact of TCF2 alterations on renal function is difficult to analyze because of the age of the children. Five of 11 children who had reduced renal function were younger than 1 yr at last follow-up; one might speculate that the interpretation of these young patients’ renal function could be difficult as (1) renal maturation was not completed at that age and (2) renal failure may be unmasked after the first year of life as body mass increases. Thereby, renal function of these patients may be under- or overestimated. The long-term follow-up of this cohort may further enlighten this aspect. Nevertheless, our results suggest that the degree of renal insufficiency may not be related to the presence of TCF2 anomalies but rather to the degree of hypo/dysplasia and thus the degree of nephron loss. Indeed, 81% of patients with a GFR <80 ml/min per 1.73 m2 had hypoplastic kidneys and 91% had hyperechogenic kidneys, whereas only 33% of the patients with a GFR <80 ml/min per 1.73 m2 were carriers of TCF2 anomalies. Corroborating this hypothesis, a similar prevalence of renal failure was observed in patients without TCF2 anomalies. Similarly, none of the reported children has overt diabetes. At least two hypotheses may account for this observation. TCF2 anomalies may be involved in a phenotype that is restricted to abnormalities in the renal development. Several reports of the variable clinical spectrum associated with TCF2 have described isolated phenotypes (7,8,10,12). Alternatively, the disease related to TCF2 anomalies may be progressive. Several observations support this second hypothesis. In adult patients, the renal disease precedes the development of diabetes, and insulin deficiency progresses in the course of the disease (17). In our cohort, insulin secretion was not assessed, so we cannot exclude completely abnormalities of glucose metabolism. Comparisons of antenatal and postnatal sonographies have also shown structural changes of renal lesions. From a molecular point of view, the complete gene deletion was the most frequent anomaly detected in children and represented two thirds of the TCF2 anomalies. This observation contrasts with results of a recent study that reported one third of TCF2 deletions in adult patients with MODY5 (20). These findings may suggest that the TCF2 gene deletion is associated with a more severe renal phenotype. This hypothesis was supported by the fact that most of the deletions that we identified in children occurred de novo. We did not observe any difference in the phenotype of the patients with mutation compared with those with deletion. These results corroborate those obtained in adult patients with MODY5. Our study has major implications in the diagnosis and follow-up of children with renal morphologic anomalies. First, TCF2 genetic testing should be considered in patients with bilateral renal morphologic anomalies that are diagnosed in childhood or on antenatal sonography independent of the family history or other extrarenal manifestations related to TCF2. Second, because of the mutational spectrum revealed in our pediatric cohort, the search for large genomic deletions should be carried out as the first diagnosis strategy for TCF2 molecular diagnosis. Third, family screening has shown that half of TCF2 anomalies and principally genomic deletions occurred spontaneously, thus leading to a weak probability of recurrence. Finally, no definitive conclusion concerning the course of the renal function and development of extrarenal manifestations—diabetes in particular—can be drawn, requiring long-term follow-up of TCF2 patients. This study, which is the first systematic analysis of a pediatric population with a previously defined renal phenotype, provides further insights into the complex molecular events that are involved in renal structural lesions and, in particular, renal dysplasia and cortical cysts. TCF2 mutations have been shown to be an important genetic anomaly related to renal dysplasia with cysts. We are grateful to Dr. José Timsit for critical reading of the manuscript.